The world is in danger! Join Seraphine in this amazing adventure and save the world from doom! 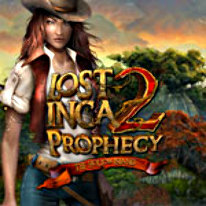 Join Seraphine in this amazing adventure to save the world from its doom in Lost Inca Prophecy 2: The Hollow Island. The entire world is in danger. Volcanoes are erupting and the earth is shaking. You are the only one that can prevent the Prophecy from happening. Enjoy the incredible matching fun and unique mini-games in this great match 3 game.